MWC: Samsung Galaxy Note 10.1 tablet unveiled | What Hi-Fi? 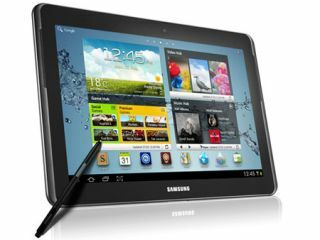 As expected, Samsung’s plan to unveil a Galaxy Note 10.1 at MWC 2012 has come true with the official unveiling of the device today. That means Samsung's existing 5.3in Note has got some serious company, though the 10 inch version has been stripped of the call-making abilities of its smaller smartphone sibling. Still, the Galaxy Note 10.1 will be bringing the S Pen to a more recognisable tablet format, and it runs the latest version of Android, 4.0, or Ice Cream Sandwich. There's a 1.4GHz dual-core processor on board and Samsung’s also kitted out the Galaxy Note 10.1 with a 3MP rear-facing and 2MP front-facing camera.